Letter to Derek Jeter: How About Helping 30,000 Young People? Derek, if you think 3,000 hits is an achievement (and of course it is! ), try helping 30,000 young people to stay away from drugs and become leaders in their communities. That's really changing the bigger game. You have a lot to celebrate. Your 3,000th hit was a home run that put your team back in the game. Your team went on to win, and you collected four more hits that day, adding an exclamation point to an already remarkable baseball achievement. And there are more achievements to come. 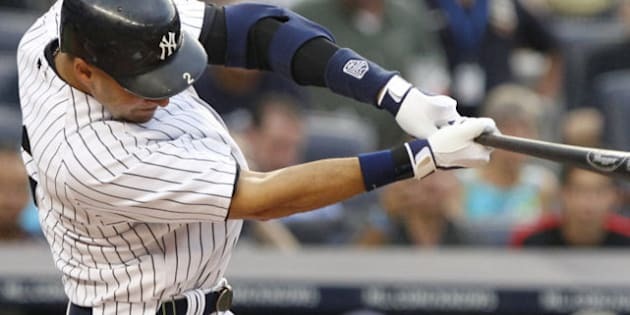 If you play another few years, and with reasonable productivity, you are likely to celebrate a dozen significant milestones, including, for example, 11,500 plate appearances, 7,000 assists, 2,800 singles and 2,000 runs scored -- all these are within reach. There is no question that you, as New York Yankees shortstop and captain, have earned yourself a place in the National Baseball Hall of Fame in Cooperstown. You worked for it. You deserve it. What accounts for your success? Your well-known focus, determination, goal orientation, preparation and integrity are all key factors. Now, as you enter the last years of your active baseball career, these same factors can propel you to an elite level as a philanthropist and activist. In fact, that is exactly where you should turn your attention; it's the arena in which you should now ramp up your performance. And it's exactly the right time to do so. Yes, I know you already help hundreds of kids each year. Your vehicle for doing this is your private charity, the Turn 2 Foundation, in which your family is very active. The foundation is a serious entity, does very good work, and you are rightly proud of it. Over 15 years, Turn 2 has made $12 million worth of grants to programs promoting healthy lifestyles among youth -- to help them avoid drugs and alcohol and become community leaders and responsible citizens. With your capital supplemented by funds raised through an annual dinner and celebrity golf tournament, the foundation runs an impressive suite of initiatives: scholarships, camps, baseball clinics, an after-school program, and more. These activities are centered primarily in New York City, West Michigan and Tampa Bay, all areas where you have personal roots. One of your best programs is Jeter's Leaders. Eight to 10 high school students in both Kalamazoo and New York are invited to join the program for four years. Community service, biweekly leadership meetings, mentoring, life skills and leadership skills workshops, drug and alcohol awareness, and college preparation and visits are key activities for all Jeter's Leaders. Participants must maintain a B average and say free of drugs and alcohol for the duration of the program. This is all good; better than good, in fact. It is an excellent model. However, you and I know that the challenges young people and communities face are so large and complex that building hundreds of young leaders is not enough. We need tens of thousands. And you are in a position to make that happen. You have a lot to build on if you decide to do more. There are five practical ways for you to convert your current assets and knowledge into larger-scale action. First, you should transfer more capital to your foundation. It needs a larger endowment in order to make more grants. You have the resources. Over the next few years, you'll earn at least $56 million, and as much as $65 million, and maybe a similar amount again from endorsements. Second, mobilize other people's money on a larger scale. Work with major philanthropists like Bill Gates, Warren Buffet and Bill Clinton to expand the pool of funds available to your programs. Use your star power to get other sports celebrities to give more. Move them from photo ops to major gifts. Third, get the federal government and states to adopt and replicate your programs, especially the leadership work. Scale up the size of each city's program from 10 to 50 to 100. Scale up the number of cities and regions you work in, from two to 20 to 50 and maybe even to 100. This is ambitious, but it is feasible. Fourth, hire professionals who have proven skills in implementing large-scale programs. Inspired by you, they will bring this bigger vision to life. Finally, evaluate, learn from and adjust your programs -- continuously -- as you scale up. Understand what works and what doesn't, and talk about it. People know how hard this work is and will respect and support you even more. In 1996, after you had signed with the Yankees and were sitting in a hotel room with your father, you announced that you wanted to set up a foundation. And you did. You remember every day why you set that foundation up: to make a difference in lives and in communities. Now you can take this commitment to the next level. You will have even more to celebrate. Thanks for taking the time to read this. And best wishes for continued success--on all fronts.